This type of gift arrangement allows you to direct gifts to Stony Brook for a specified period of time and, in turn, receive either a charitable deduction now for gifts made in subsequent years or a reduction in gift or estate taxes on property you wish to pass to heirs. 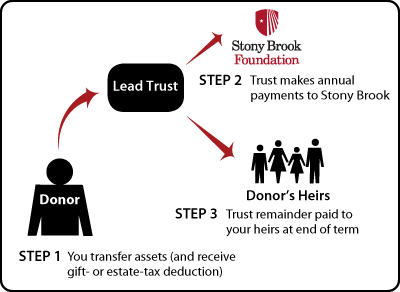 Under the nongrantor plan, you irrevocably transfer assets to a trustee and provide that payments be made to Stony Brook University for a certain number of years (or until the end of your or another's life). Then the principal is distributed to your children, grandchildren, or other heirs. The principal passes to your heirs at greatly reduced gift- and estate-tax rates and sometimes escapes them altogether. The charitable lead trust may appeal to individuals who wish to make a gift but retain the property in their family. 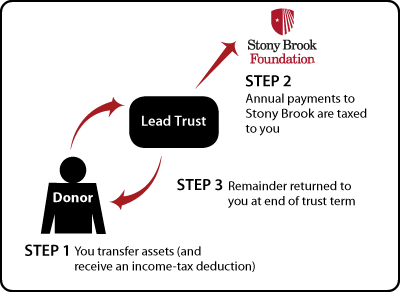 The payments (gifts) to Stony Brook must be an annuity interest (fixed-dollar amount annually) or unitrust interest (fixed percentage of the fair-market value of the trust assets determined annually). There are no minimum or maximum payout rates. The charitable beneficiary must be an organization described in the appropriate sections of the IRS Code. Stony Brook University is a qualified charitable organization.